Amongst Indian sweets, ladoos are very popular in every household. 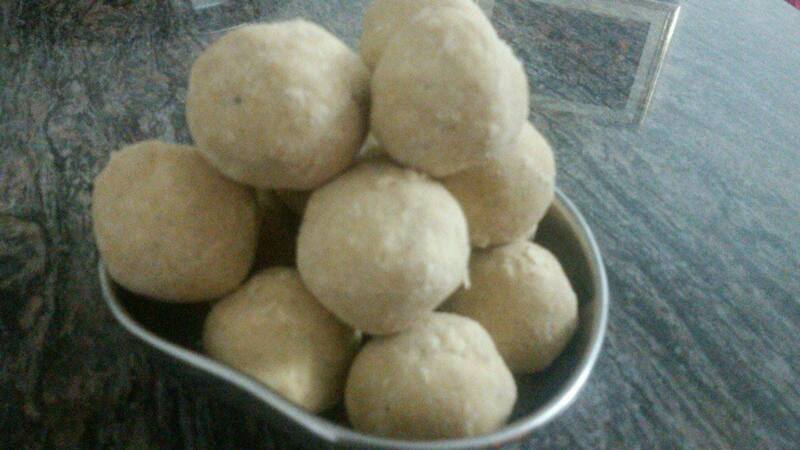 Elsewhere in this blog, you will find recipes for Besan Ladoos and Rava Ladoos. In any Konkani GSB household, I guess "Churmundo" ( Ladoos made of wheat flour/atta) will rank as one of the favourite sweets made on festive occasions, and indeed any time else as everyone in the family invariably loves them. The recipe for Churmundo today comes by way of a Guest Post by my friend, Shamala Bhat from Bengaluru. Thanks, Shamala. The addition of raisins and cashewnuts roasted in ghee is optional as they enhance the taste of the churmundos. These are added when the mixture is cooled before shaping them into ladoos. If stored in air tight containers, churmundos can last for a few weeks to a month provided they are all not polished off by then. Add the powdered sugar and cardamom powder and mix them well.